Learn about the cap construction that provides the most comfort for you. 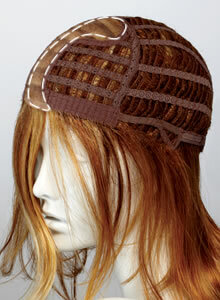 Lightweight stretch wefts make this cap light, comfortable, breathable. The soft velvet band at the front ensures all day comfort. 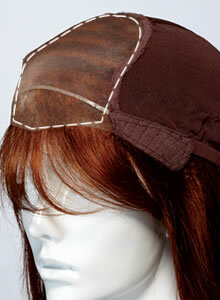 Bendable ear tabs and the fine Velcro® tapes allow you to adjust the wig for a custom fit. Provides comfort, breathability, and a totally natural looking part. The part or crown of the cap is constructed with a fine poly-silk mesh material that allows your own skin colour to show through. 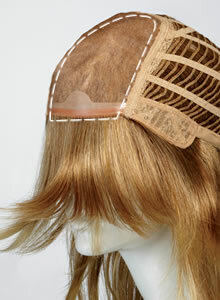 Wig fibres are 100% hand tied to this sheer fabric, providing comfort, breathability, and a totally natural looking part. A very natural look and greater styling flexibility. 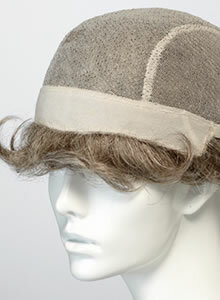 The top area of the cap between the front hairline and the crown of the cap is constructed with a fine poly-silk mesh material, which allows skin colour to show through. Wig fibres are 100% hand tied to this sheer fabric, providing comfort, breathability, a very natural look, and greater styling flexibility. For versatility with natural off-the-face styling. A deeper strip of fibres along the hairline is individually tied by hand to ultra-fine, sheer mesh lace that extends a bit onto your forehead and virtually disappears against your skin. The strands appear to be growing directly from your scalp! The lace front allows for versatility with off-the-face styling. No one will be able to detect that it’s a wig ... even up close. Natural looking growth and multi-directional styling. Each hair throughout the entire top is individually hand tied, creating the appearance of complete natural hair growth. 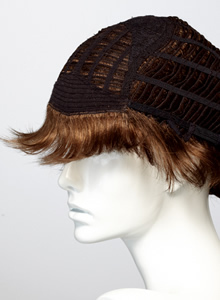 It allows you to style your wig in any direction just like your own hair. The ultimate in modern wig technology. 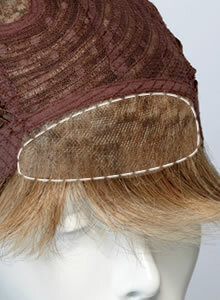 The sheer lace front is hand tied on an almost invisible mesh that blends with your own skin tone. The fibres are 100% hand tied for the most realistic hair movement and styling versatility. These top-of-the-line features combine to give the look of hair that is growing right out of your scalp for a most natural looking hairline.